I can't imagine the immense pain that Hope felt every time she had to see yet another one of her babies stolen from her to be killed for meat or to be raised for milk like her. The farmers didn't view her as a sentient being; they saw her as a machine they could use for their own profit. And when they were done with her, they were going to kill her. I can clearly remember the first time I visited For the Animals Sanctuary (FTA). It was a time in my life that was really stressful. I had a lot of things going on at once and had been going through the death of a loved one. I headed to FTA because ever since I went vegan I wanted to visit a farm animal sanctuary, and I had heard about this little family-operated one in NJ that I just had to check out. After taking part in a Halloween fundraising event for the sanctuary and meeting Debbie and Theresa, I decided to participate in one of their volunteer work parties. The best part of the day was getting to spend time with the animals after all the hard work was over. And one of the sanctuary's residents, Hope, really stood out. 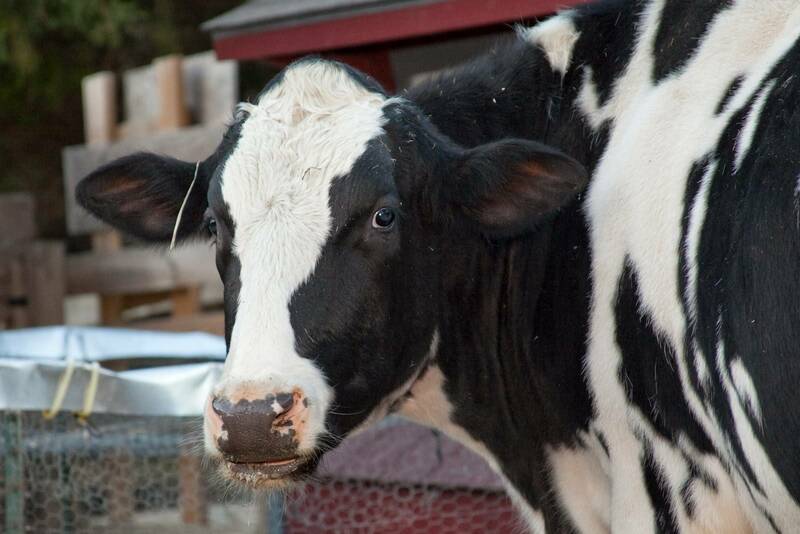 She was a dairy cow before she was rescued. She had been raped and impregnated multiple times and had all of her babies stolen from her every time. You could see the damage that was done to her hips as a result of the abuse, the confinement, the depletion of nutrients from her body as a result of the terrible life she once led. But now Hope was a powerful, beautiful female energy. She was calm and approachable, unafraid of all the new human faces. At one point, she looked right at me and I reached out my hand, which she gently touched with her nose and licked with her rough cat-like tongue. I am so happy to have a photo of that precious and unforgettable moment hanging on my fridge to this day. Hope has since left the sanctuary. Her hips eventually gave out---a long-held fear that had finally come true for the sanctuary staff one winter---and she had to be euthanized. I remember reading the heartbreaking news, thinking about everything that she had been through and how she never deserved to suffer. Yet, after everything that she had endured, she managed to forgive and to love people. She was a gentle yet powerful soul all at once, and one that truly touched my spirit in a profound way. I can't imagine the immense pain that Hope felt every time she had to see yet another one of her babies stolen from her to be killed for meat or to be raised for milk like her. The farmers didn't view her as a sentient being; they saw her as a machine they could use for their own profit. And when they were done with her, they were going to kill her. Thankfully, though, she was one of the very few lucky ones who was rescued. And when Amy, a calf saved from being left to die in a stall, came to FTA, Hope adopted her as her own child and became her mother. She finally got to be a mom, and she was the perfect guide and guardian to Amy as she grew. Hope may not physically be at the sanctuary anymore, but her energy was too strong to simply fade away. She is the reason I follow a vegan lifestyle. She was a symbol for everything that's wrong with the way animals are farmed for dairy and meat. Yet she was, and still remains, an ultimate symbol of motherly love, of strength beyond words, and of the ability to forgive and find hope in a world that's so often too dark.